The best-selling Molly Brown Signature Pearl Station Bracelet features lustrous freshwater pearls on a sterling silver chain. 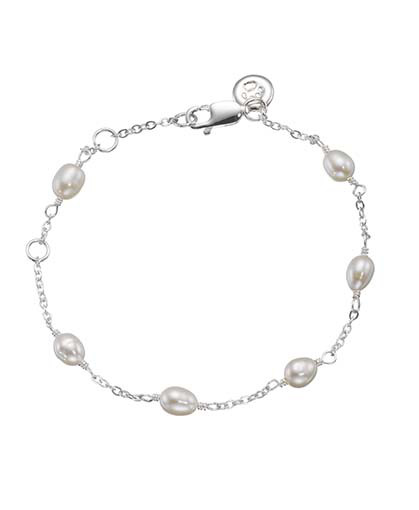 The bracelet is adjustable at 13cms, 15cms and 17cms to fit most girls' wrist sizes and ages. A matching Signature Pearl Station Necklace is also available. This best-selling bracelet is one of the core favourites from the Molly Brown Collections and is the perfect gift for all special occasions. PEARL CARE: Pearls can be cleaned using a soft lint-free cloth, dampened with water, allow pearls to air-dry before putting away. Store in jewelry pouch provided with purchase.